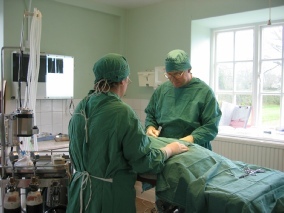 Mr & Mrs Jones have a long standing interest in all aspects of veterinary surgery including soft tissue surgery and orthopaedic surgery. Mr. Jones had the privilege of working as house-surgeon at the Royal Veterinary College with one of the foremost orthopaedic surgeons Professor Leslie Vaughan in the mid seventies. He feels that that the surgical principles & techniques instilled in him at that time have been invaluable to him. He enjoys the challenge of orthopaedic surgery and of the more complex soft tissue surgical procedures. Mrs. Jones is also interested in surgery. She enjoys running the veterinary practice with her husband, which they have done for 38 years. Mrs Jones enjoys working with all the staff as a team to care for the patients that come to the surgery. Mr & Mrs Jones are grateful for the support they receive from the staff. Tracey Worthington is the Practice Manager. 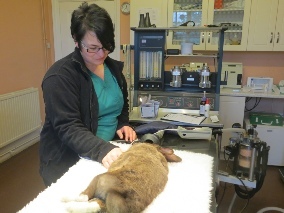 Tracey has been trained in-house as a veterinary nursing assistant. Whilst she loves looking after the the animals and the clients she is also interested in the business side of the practice. She has passed NVQ level 5 Diploma in Business Management. She is now studying for the AMTRA SQP qualification. Maria Haywood is a veterinary nurse trainee. Maria is in her second year of studying the level 3 diploma in veterinary nursing at Glynllifon college. Mr & Mrs Jones would like to thank all their clients for their support. They feel that they know many of them & their pets very well as they have been coming to the practice for many years. They feel privileged to be entrusted with the care of their pets.